Kristin Harris Walsh is a dancer and dance scholar based in St. John's. She holds a PhD in Folklore from Memorial University and a Master’s in Dance from York University and currently is working on a SSHRC funded research project on percussive dance in Newfoundland and Ireland. 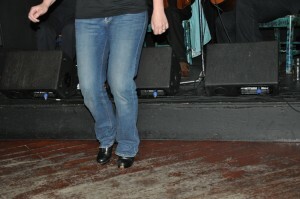 Kristin has been step dancing for 15 years and has trained and performed in Newfoundland and Ireland. She is Past President of DanceNL, the province’s sectoral dance association, and is the President of the Society for Canadian Dance Studies. In this interview, we talk about step dancing, percussive dance, and the challenges and opportunities for safeguarding traditional dancing in Newfoundland and Labrador. Recorded on 4 August 2015. Photo of Kristin dancing by Meghan Forsyth.